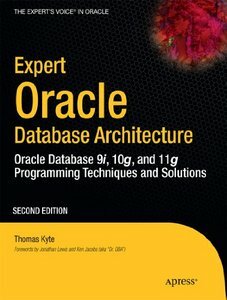 Now in its second edition, this best-selling book by Tom Kyte of Ask Tom fame continues to bring you some of the best thinking on how to apply Oracle Database to produce scalable applications that perform well and deliver correct results. Tom has a simple philosophy: you can treat Oracle as a black box and just stick data into it or you can understand how it works and exploit it as a powerful computing environment. If you choose the latter, then you’ll find that there are few information management problems that you cannot solve quickly and elegantly. This fully revised second edition covers the latest developments in Oracle Database 11g. Each feature is taught in a proof-by-example manner, not only discussing what it is, but also how it works, how to implement software using it, and the common pitfalls associated with it. Don’t treat Oracle Database as a black-box. Get this book. Get under the hood. Turbo-charge your career.